The GetDBApp (ESI.Octopus.GetDBApp.exe) program allows to download the Octopus database from a database hosted on our servers. The program can be automated using the Windows Scheduled Tasks to download the database everyday. Note that the Octopus database is in SQL format. This article explains how to use the GetDBApp program. Before looking at the technical aspect, make sure you have access to the option. 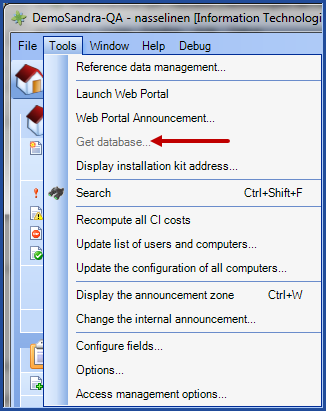 From Octopus, go to Tools > Get database and see if the option is greyed out. If the option is greyed out, make the request to activate the option to the Octopus Service Desk. Once the option is available, continue with the next steps. A server running SQL Server 2014 Standart SP1 as a minimum version. Enable this feature: Full-Text and Semantic Extractions for Search. A user that is authorized to delete and create databases on the SQL server. A shared directory on the SQL server to which GetDBApp will download the backup file from the Octopus server. Ex: (\\MySqlServer\OctopusBackups\). A computer which will execute GetDBApp (included with the Octopus installation). ​Install the Microsoft component: Microsoft SQL Server Data-Tier Application Framework. ​​​If the computer or Server is running in 64 bits mode, you must install both 32 and 64 bits versions. ​Example of installation folders: "C:\Program Files\Microsoft SQL Server\140\DAC\bin" or "C :\Program Files (x86)\Microsoft SQL Server\140\DAC\bin". ​Add the installation folder (Corresponding the the Windows version) in the Windows system variable "PATH" in the system variables. ​Right click on the Computer icon of your desktop (or in the left panel of the file explorer) and in the contextual menu, goto Properties. In the opened windows, click on the link Advanced system parameters on the left. In the new window, click on the Environnement Variables button. NOTE: The backup of the Octopus data is performed every evening. On execution of the program GetDBApp, so you get a copy of the previous day. GetDBApp is a command line type of program (DOS). Is is designed to be easily automated (the section for Use GetDBApp from a command line describes how to automate the GetDBApp execution). It is located in the local Octopus directory of your computer (C:\Program Files\Octopus) or in (\%homepath%\AppData\Local\Octopus). The next section explains how to prepare the configuration file. Allows you to keep the downloaded file (backup) in your shared folder after it was restored on your SQL server. Without this parameter, GetDBApp will delete it. Depending on the datacenter hosting your database, your backup file could be missing a timestamp. If this is the case, you will have to rename the file as to not prevent the next execution of GetDB – which would fail if the file already existed. Will move the log file. By default, this file named GetDBApp.log will be located in the Octopus folder, where you find the GetDBApp executable. If you move this file from the Octopus folder, make sure the folder exist (the system cannot create the folder). Also, the path needs to contain the name of the file. Allows to download the file without restoring it. The configuration file is a text file which contains the information about the SQL server, the shared folder and other parameters required by the program. This file uses the XML format. NOTE: Before starting to create the configuration file, be careful not to break the file format by modifying the tags or the file structure. One missing or additional character (for example, a "/", ">", or "<") could make the file useless. Make sure that the specified values are valid. Don't leave any blank spaces before or after the values. If an error occurs with the configuration file, the software will shut itself down without a problem. However, error notifications aren't very clear, so it could be difficult to find errors. A thorough verification of the values is recommended before starting the program. You need to modify the section highlighted in yellow ONLY. The tags are described in the next section. Note:Before you test GetDBApp, it is recommended to test the SQL server connection. To automate, refer to the Windows Scheduled Tasks article.. Note that the database is available from 4h00 AM (UTC -5:00). ​This message is part of the normal process of restoring your database.